A man's suffered a suspected broken leg after jumping out of an upstairs window to escape from masked men who broke into his Larne home. The gang forced their way into the flat in the Ballycraig Ring area shortly after 7.30 last night, armed with bats and irons bars. The intruders assaulted the homeowner - before he made his escape out the window. A 34 year old man has been arrested in connection with the incident - and remains in police custody. 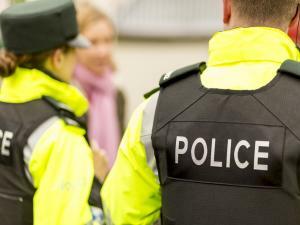 Detectives are investigating the report of an aggravated burglary at a flat in the Ballycraigy Ring area of Larne at around 7.30pm on Saturday 16th March. Anyone with any information is asked to call 101 quoting ref 1178 16/03/19.